Many of you, looking at the sky, always know, west, or at least you can easily recognize the constellation Orion. Orion the Hunter, which has nothing to do with the world of the Orions Star Trek master race and green ladies, matriarchal, engaged in the slave trade and, although part of the Federation, have better relationships with the Klingon Empire with the rest. 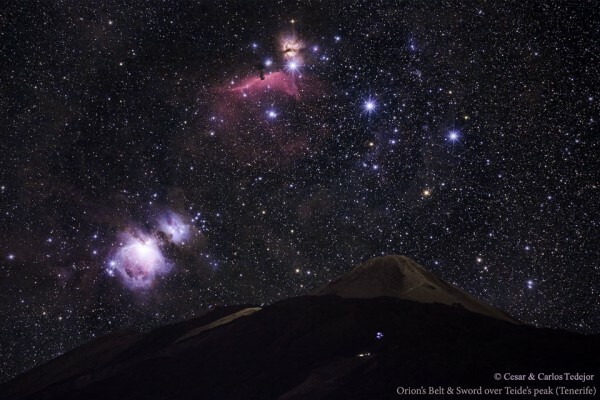 In the picture you see, you can see the Teide (yes, the Canary Islands) and the above, the constellation of Orion where what we see is just the best belt thereof, the 3 stars famous. What few know and you see in this picture, is another famous nebula Nebula Horse, so called because it is the shape of the head of a horse in it is located just stuck (in fact it is part) of the Orion constellation. With this image, taking several months, you can perfectly observe this nebula (this turned upside down compared to what we see always) and therefore its location in the sky. In fact, stuck to “horse’s head” (you might remember that it is nothing more than cosmic dust that blocks light and they just have that curious way) you can see the Flame Nebula (yellow, attached to the horse ), which is nothing more than ionised hydrogen by light (emission) of the stars around and that is an area of ​​creating new stars because of its density.